Run the papaya and chayote through the grating attachment of your food processor (or you can do it on a regular cheese grater, or julienne them). Transfer to a large bowl and stir in the cilantro and chopped peanuts. What better way to momentarily escape one's mundane existence than through food? If you can't afford the jet-set lifestyle, you can explore the world in your own kitchen, and here are five party appetizers that will do just that. The ploughman's lunch is such an easy party platter, and no English pub party would complete without one. Just arrange bread, butter and mustard, cheeses, various pickles and maybe some apple, if you fancy. I love a good, sharp Stilton or cheddar, and I use homemade pickled beets and gherkins—and maybe a bit of pickled sweet onions in lieu of Branston pickle (a sweet, vinegary pickle relish). This makes a great lazy picnic lunch, too. Okay, technically, these meat and cabbage-filled buns are a traditional food of Germans who settled in Russia in the 18th and 19th centuries, and they're a staple of every Volga German household in the Midwest. If you've ever been curious about what Mennonites and German Argentines eat, you're in luck. Just sauté ground beef with shredded cabbage and finely minced onions, season with salt and pepper (I like to add chopped fresh dill and caraway seed) and add a few spoonfuls to bread dough. Fold up like a mini calzone and bake at 450 degrees for about 10 or 15 minutes, or until golden brown. My favorite size for a bierock is that of a slider, but bite-sized versions using packaged biscuit dough would be excellent, too. Croquettes look so elegant with a skewer, or just arranged on a pretty little plate. And they're so simple to make. Just mix together a can of drained tuna, an egg, some bread crumbs and sautéed minced onion. Then add a little spoonful of Dijon mustard, a bit of chopped parsley, salt and pepper. Form into little balls (I like to use a mini ice cream scoop for perfect portioning) and roll in panko bread crumbs. Fry on both sides in a little bit of oil until golden brown, or spritz with cooking spray and bake in a 400 degree oven for about 15 minutes, or until golden. Serve with an aioli of mayo mixed with minced garlic and finely minced herbs. What better way to taste Thailand than with this perfectly balanced, sweet/sour/fresh/crunchy/spicy/salty salad? I like to make a version of this Thai papaya salad using chayote squash, which are sometimes easier to find (can be found in Mexican and Asian groceries). They're crunchy and semi-sweet like a green papaya, and pretty cheap. 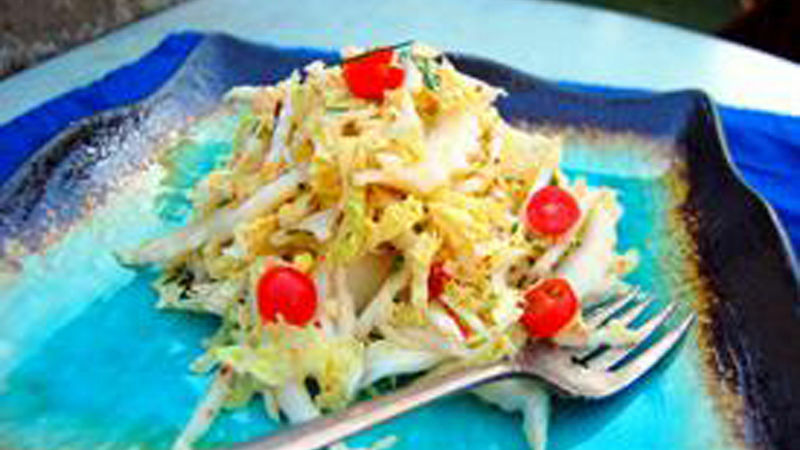 Here's my recipe for som tam using both papaya and chayote. Every time I go out for Japanese food, I have to order a round of gyoza, or pot stickers, before the meal comes. I like making them at home, too, because then I can use any ingredients I want and eat about thirty of them. To make my favorite version, mix together cooked ground pork, finely sliced napa cabbage and scallions, minced shiitake mushrooms, minced garlic and grated ginger. Add a splash each of tamari, Chinese black vinegar, sake, sesame oil and mirin, and some pinches of salt. Then fold them up in store-bought wonton wrappers, being as meticulous as possible (wipe a little water on the edges before pinching to adhere them). Steam for five minutes, then pan-fry until crispy on the bottom. Easy! I hope you'll venture out of your comfort zone and taste the world from your kitchen.